Today`s bedroom furniture for children is practical, sturdy and exciting. Gone are the days of boring brown bedroom furniture which did not last long. Children now have a great range of colours from which to choose as well as many different styles of bedroom furniture. Designers and manufacturers are constantly on the lookout for innovative ways to make children`s bedroom furniture more interesting and more suitable for the way we live today. Shelves and bookcases are always useful in children`s bedrooms and bedroom bookcases contain sensible features such as adjustable shelves. Bookcases come in beech, oak, white laminate and various colours to suit all tastes. There are even bookcases which fit tight to a wall, as a slight overhang at the top of the bookcase can mean it fits flush over a skirting board. Chests of drawers come in various widths and heights. These items tend to fill very quickly, so it is always a good idea to buy the largest one possible for a bedroom. If room size tends to be a problem, then go for height. Tall chests of drawers allow for much more storage. If children are unable to reach the drawers right at the top, you can use them initially for bedding or clothing, leaving the lower drawers for the child`s own personal items. Children`s toy boxes really do need to be sturdy and hard wearing as they normally get quite a battering. Furniture makers realise children don`t often treat things very carefully so stays are put in place to stop lids slamming shut, for example. Pieces of Lego can be stored away in small inner boxes too, which is a great help when it comes to finding toys. Toy boxes really do help to make a room stay neat and tidy. Children`s wardrobes are available in different designs and colours. With flexible shelving, full or split hanging, the wardrobe space can be totally flexible. You can also buy bespoke children`s bedroom furniture, giving you the opportunity to choose from a great selection of colours and finishes. Cabin beds and high beds are great space savers. Modern homes are often quite small and these beds make it possible to incorporate not only a bed but also a chest of drawers or a desk into the same space. Manufacturers know that children today acquire many gadgets as they get older and the desks are wide enough for computers. 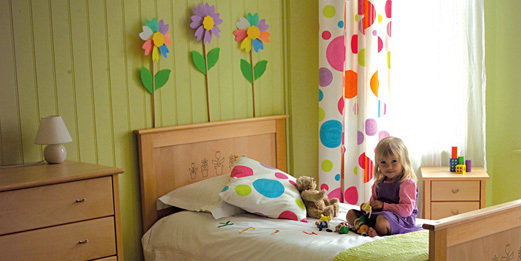 Space saving is extremely important when it comes to children`s bedroom furniture. Thankfully today`s designers know exactly how to achieve this and use every inch of space when considering ideas for new products. Bunk beds can mean two children can use the same bedroom. It`s important the beds are hard wearing as well as comfortable, with plenty of headroom. A good bunk bed will be suitable for an adult to use too and mattresses need to be hard wearing as well as comfortable. Childrens bunk beds are a sensible choice for a bedroom because even if you have only one child of your own, he or she will inevitably invite friends to stay.